For 2014–2015, National Ambulatory Care Reporting System (NACRS) abstracts that contained Main/Other Problem and were reported in this table included all Emergency Departments (EDs) in Ontario and Alberta, as well as 27% of ED visits in Prince Edward Island, 17% of ED visits in Nova Scotia, 6% of ED visits in Manitoba and 89% of ED visits in Yukon. Data from Saskatchewan and British Columbia did not include Other. Source: CICH graphic created using data adapted from the National Ambulatory Care Reporting System, 2014–2015, Canadian Institute for Health Information. https://www.cihi.ca/en/national-ambulatory-care-reporting-system-metadata -accessed June 23, 2017. 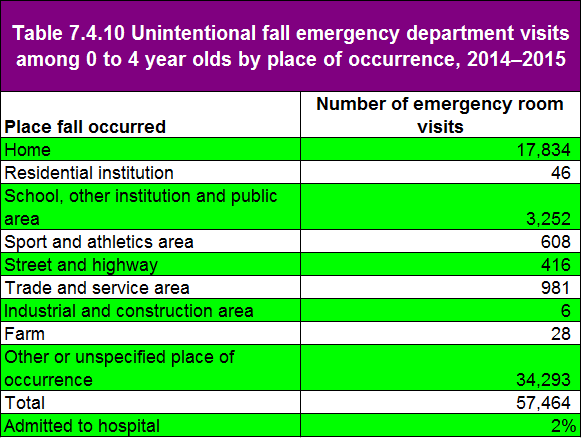 In 2014/15, there were over 57,000 emergency room visits among 0 to 4 year olds because of falls. About one-third of the falls happened at home. In 2% of cases the child was admitted (1,149 admissions) to hospital. 1Takuro Ishikawa. Research Highlight: Are Emergency Department visits the best time to educate parents on injury prevention? Parachute Website. http://injuryevidence.ca/injury-hospitalizations/- accessed June 24, 2017.